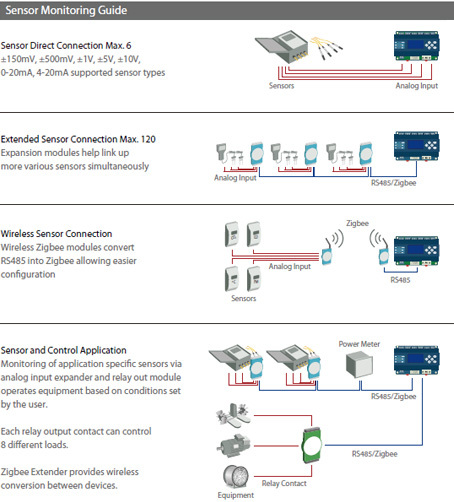 EM100 let users define the "unit" of measurement for each sensor type, define and set boundary limits to data points for alarm and activate relay outputs upon customized conditions, all this without the need of PC or PLC software. Real-time diagrams or single-line diagrams can be fully customized via WEB settings to place various numeric objects on a single real-time display page. Numeric objects can be linked by users to any sensor or energy data or even calculated data from formulas. after office hours. Both "warning" and "over" limits can be set for all loads. EM100 can record sensor inputs from air and water/soil quality data, temperature data or electric current data every single 1 minute intervals. The function gives power to the user to see quick fluctuations of the environment and troubleshoots in detail. The innovative formula function let users define any conditions to turn ON/OFF equipment such as lights, fan, heating or air pumps via the relay output module. Pulse modulation or direct ON/OFF supported. Formulas are a flexible way for the operator to define alarm by email conditions or relay output conditions for a specific application. Almost all parameters read by power meters, sensors and time can be used as formula conditions. Users can self-define various different categories of energy, for example: Lighting, Outdoor Lighting, Process1, Motor or HVAC. Simply assign the meter or CT into any of the user defined categories to create reports and benchmarks. 4 different layers of categories can be set and filtered. No budget to install meters in every location? What about creating a virtual load by entering the kW rating of the load and the estimated running time. Or simply use formulas in our formula function to estimate this virtual load by another load that already has actual metering data. EM100 does not depend on the PORTAL to run! 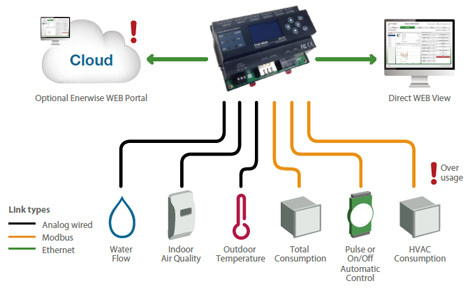 It operates as a stand-alone controller unit, which means the web display and control functions are real-time! No dependency on internet networks, no security concerns for sharing critical data to another 3rd party company.